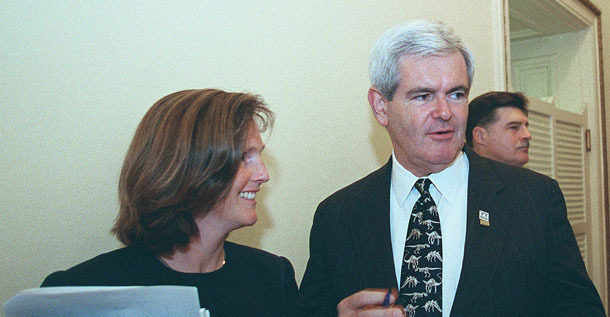 American Legislative Exchange Council CEO Lisa B. Nelson helped House Speaker Newt Gingrich promote his Contract with America in the mid-1990s. I don't envy Lisa B. Nelson, the new CEO at the American Legislative Exchange Council (ALEC). If Nelson thought she was going to be able to quietly go about her business when she joined the secretive lobby group in mid-September, she was sadly mistaken. Not only did she join an organization that has been hemorrhaging members, she also was immediately thrust into the media spotlight to defend it from the charge that it is "literally lying" about climate change. Most remarkable was the source of the accusation. Public interest groups have been pummeling ALEC for a range of transgressions, including its scientifically challenged position on global warming, but the charge came from Google, one of ALEC's own high-profile corporate members. For reporters, it was like throwing chum in the water. So how did Nelson and ALEC respond to this unwanted publicity? What sparked this media mêlée was a comment Google Executive Chairman Eric Schmidt made on NPR's Diane Rehm Show on September 22. He was on the program to promote his new book, How Google Works, when a caller asked him, out of the blue, if Google still supports ALEC, which she linked to climate change deniers. The "consensus within the company" was that funding ALEC was a "mistake," Schmidt replied. He then said Google "has a very strong view that we should make decisions in politics based on facts.... And the facts of climate change are not in question anymore. Everyone understands climate change is occurring. And the people who oppose it are really hurting our children and our grandchildren and making the world a much worse place. And so we should not be aligned with such people. They're just literally lying." Of course, many Diane Rehm Show listeners probably had never heard of ALEC, which is just what the group would prefer. Since its inception in 1973, ALEC -- which bills itself as a "nonpartisan" promoter of "free markets, limited government and federalism" -- has been quietly disseminating sample state legislation, ranging from measures that would repeal renewable energy standards to ones that would institute discriminatory voter ID requirements. Most of the group's funding comes from the more than 200 corporations, trade groups, corporate law firms and industry-funded think tanks that pay annual dues of $7,000 to $25,000, plus as much as $40,000 to sponsor an ALEC conference session. Those tax-deductible fees grant them direct access to ALEC's 1,800 legislators -- who are 98 percent Republican -- and the opportunity to draft sample bills that serve as templates for statehouses across the country. Later the same day Schmidt appeared on NPR, Google officially terminated its ALEC membership. The announcement came three weeks after more than 50 public interest groups and unions sent a letter to Google urging the company to leave ALEC, the culmination of a year in which hundreds of thousands of Americans signed petitions asking the company to quit. Google is just one of more than 90 companies that have deserted ALEC since 2012, largely due to public pressure as well as ALEC's unpopular policy prescriptions, particularly National Rifle Association-sponsored "stand your ground" laws. The steady parade out the door includes such corporate colossi as Coca-Cola, General Electric, IBM, Microsoft, Procter & Gamble and Wal-Mart. And in the days following Schmidt's outburst, other Internet companies headed for the exit. Yahoo cancelled its membership, Facebook said it was unlikely it would renew next year, and Yelp disclosed it was no longer a member. Nelson had been on the job for just one week, and she had a public relations disaster on her hands. Nelson is no stranger to controversy. In the mid-1990s, she served as Newt Gingrich's public affairs liaison when he was speaker of the House. Her job was to sell Gingrich's Contract with America, which aimed to roll back regulatory and environmental laws, to state governors and legislators. She stepped into that job in 1995 after running GOPAC, a Republican Party field operation that trains candidates at the local and state level. By Nelson's own admission, she was caught flatfooted by Google's defection, but she wasted no time wading into the fray. In a statement issued just hours after Google confirmed it was leaving ALEC, Nelson blamed the company's departure on "public pressure from left-leaning individuals and organizations who intentionally confuse free market policy perspectives for climate change denial." Ostensibly to demonstrate that ALEC takes global warming seriously, she cited a "roundtable discussion between a variety of companies -- including Google -- regarding renewable energy deployment and climate change" at ALEC's annual conference in Dallas that ran from July 30 through August 1. "The conversations held in Dallas were intended to build understanding and pioneer future policy approaches where organizations could find common ground on issues of climate change, energy generation and government mandates," she said. "And, I personally intend to continue this work." Two days later, ALEC sent a letter to Google executives signed by more than 150 of its member legislators. The lawmakers upbraided Schmidt for "falsely attacking" ALEC, contended that the organization provides a "forum for debate and exchange," and repeated Nelson's charge that Google's decision to quit ALEC was based on "misinformation from climate activists." The letter, which was ultimately signed by about 240 legislators, acknowledged that "climate change is an important issue" and referenced the roundtable discussion Nelson mentioned in her statement. I contacted Bill Meierling, ALEC's senior director for public affairs, to ask him for more details about the climate change meeting. "Who were the primary speakers at this roundtable?" I asked him in an email. "Who was in attendance? What specifically did they discuss?" Meierling wouldn't divulge who participated, but he did tell me the topics they addressed. "Roundtable participants discussed ALEC positions on mandates and subsidies," he wrote, "the role of traditional and renewable sources of energy in base load generation, and the importance of renewables to companies with strong sustainability commitment." Curiously, he didn't list climate change. As it turns out, Meierling left it out because the roundtable was not about climate change at all. It was a 25-minute session titled "Energy Use in the Technology and Communications Sectors," and the main speaker was Michael Terrell, Google's senior policy counsel for energy and sustainability. Terrell was speaking about the promise of renewables on behalf of his company and three other ALEC Internet sector members, eBay, Facebook and Yahoo. Wisconsin State Rep. Chris Taylor, an ALEC member, was in the room. Thanks to the blogs she posted while she was at the conference, we have a fly-on-the-wall account of what went on in ALEC's inner sanctum. And she assured me via her staff that no one talked about climate change at that session. According to Taylor, Terrell's presentation was greeted by a "litany of objections" from ALEC energy sector members in the audience, including lobbyists from the American Coalition for Clean Coal Electricity, Edison Electric Institute, and Peabody Energy, the world's largest private-sector coal company. Among other things, they insisted that "renewables aren't economical" and only "exist because of subsidies." "So much for progress," Taylor wrote. "By the end of the day, any hope for a reasonable dialogue around renewable energy had totally evaporated." Besides misrepresenting the subject matter of Terrell's session, Nelson and the legislators letter failed to mention that there were two sessions that did focus on climate change at ALEC's annual conference. Both were typical of the unscientific tripe ALEC has been serving for decades. One, titled "How to Think and Talk about Climate and Energy Issues," was hosted by the Committee for a Constructive Tomorrow (CFACT), sponsor of the fact-challenged Climate Depot website. CFACT handed out a four-page document extolling the benefits of carbon dioxide and denying it is a primary cause of global warming. "Carbon dioxide fertilizes algae, trees and crops to provide food for humans and animals," it read. "We inhale oxygen and exhale CO2. Slightly higher CO2 levels cannot possibly supplant the numerous complex and interconnected forces that have always determined Earth's climate." The other session featured Joe Bast from the Heartland Institute, a fossil fuel industry-funded, Chicago-based think tank with a long history of misrepresenting science. It's probably best known for posting a billboard in its home town likening climate scientists to the serial killer Ted Kaczynski. It featured a mug shot of a disheveled Kaczynski, better known as the "Unabomber," with the text: "I still believe in Global Warming. Do you?" Bast, Heartland's president, is hardly an expert on climate science. He has tried to pass himself off as an economist, but he doesn't even have an undergraduate degree. Bast's slide show presented such patently false claims as: "There is no scientific consensus on the human role in climate change" and "The [U.N.] Intergovernmental Panel on Climate Change (IPCC) ... is not a credible source of science or economics." Bast urged ALEC legislators to "oppose carbon taxes," "repeal renewable power mandates," and "oppose Obama's plan to regulate CO2 as a pollutant," despite the fact that the Supreme Court ruled that the Environmental Protection Agency (EPA) has the authority and responsibility to do so under the Clean Air Act. Immediately following Bast's session, ALEC held a meeting for legislators and fossil fuel industry lobbyists to hammer out the wording of a sample state resolution against the EPA's pending power plant carbon emission standard. Presumably ALEC scheduled Bast's deceptive presentation purposely to influence that discussion. After all, why should legislators support carbon cuts if, as Bast's slide show erroneously claimed: "The likely benefits of man-made global warming exceed the likely costs"? I asked Meierling why ALEC gave Bast the opportunity to talk about climate change at the conference. His response: "We welcome organizations from across the political spectrum to offer perspective at meetings." Apparently ALEC doesn't mind if those organizations are peddling lies. Given the uproar triggered by Schmidt's impromptu remarks, the Diane Rehm Show invited Nelson to appear on the program on October 2 to give her side of the story. Nelson was joined by Miles Rapoport, the president of Common Cause, one of ALEC's most prominent critics, and Tom Hamburger, a Washington Post reporter who has been following ALEC since 2012. So what did Nelson have to say about ALEC's take on climate change? "What we really want to do is foster that dialogue between all sides with respect to climate change," she said. "We, as an organization, specifically do not comment on climate change. What we have issue with is government mandates and subsidies that enable the government to kind of pick winners and losers as they look for energy solutions." Nelson's explanation speaks volumes about what ALEC is really all about. First, ALEC does "comment" on climate change. It has a clear position. For ALEC, the jury is still out on the role human activity plays in global warming. "Global Climate Change is inevitable," its website states. "Climate change is a historical phenomenon and the debate will continue on the significance of natural and anthropogenic contributions." Nelson, however, tiptoed around the question of "anthropogenic contributions" in an interview that ran in the National Journal a day before her appearance on NPR. Asked if she agrees that human activity is a "primary driver of climate change," she responded, "I don't know the science on that." Second, given ALEC's position on climate science, what Nelson really means by a "dialogue between all sides" is a make-believe debate over whether climate change is happening at all, and if so, what's causing it. In fact, there is no debate among mainstream climate scientists and scientific institutions worldwide over the reality of global warming and the central role human activity plays in driving it. Finally, Nelson said ALEC objects to "government mandates and subsidies that enable the government to pick winners and losers" in its quest for energy solutions. But what about government support for fossil fuels? ALEC doesn't complain about the $4.86 billion in tax breaks and subsidies the oil and gas industry has been receiving every year on average in today's dollars since 1918. Likewise, it doesn't protest the fact that the oil and gas industry is exempt from key provisions of seven major environmental laws that protect air and water quality. Isn't that an indirect subsidy, shifting the cost of damage from fracking and other activities onto the public? Compared to fossil fuels, renewables have been on a starvation diet. Between 1994 and 2009, they averaged only $370 million a year in tax breaks and subsidies. The 2009 federal stimulus package did provide $21 billion for renewables, but that support barely began to approximate the smorgasbord the oil and gas industry has enjoyed for nearly a century and the coal industry for at least two centuries. Regardless, ALEC targets federal and state support for wind, solar and other renewables. Two years ago -- after just one year as members -- the Solar Energy Industries Association and the American Wind Energy Association (AWEA) quit ALEC out of sheer frustration. "AWEA supports state policies encouraging the growth of American wind power, a clean, homegrown and affordable source of electricity that benefits consumers," Peter Kelley, the organization's vice president of public affairs, told me in a recent email. "AWEA left ALEC because it became evident ALEC works against these policies." Indeed it does. If enacted, 31 of 131 ALEC-sponsored energy bills introduced in state legislatures this year would roll back or repeal state standards requiring utilities to increase their use of renewable energy, according to the nonprofit Center for Media and Democracy, which tracks ALEC's activities on its ALEC Exposed website. The other 100 bills would, among other things, impede government oversight on fracking, penalize homeowners who have solar panels, promote the Keystone XL pipeline, and undermine the EPA's ability to regulate power plant carbon emissions. Market Solutions for Climate Change? For ALEC, the invisible hand of the marketplace will take care of everything. "ALEC supports free markets," the group's website explains, "because markets are more effective than onerous regulation at achieving optimal economic and environmental outcomes." Let's assume that's true. How would that apply to climate change? After all, the private sector will have to be a part of the solution -- a key part -- given that it is a major part of the problem. If ALEC were an honest broker, it would recommend market-based solutions, like the Republican-inspired, acid rain cap-and-trade program championed by President George H.W. Bush. But that's not likely going to happen, because doing so would alienate Chevron, ExxonMobil, Koch Industries, and ALEC's other fossil fuel industry and trade association members. Instead, the group continues to deny the science while promoting legislation that would maintain U.S. dependence on fossil fuels and hold back cleaner, low-carbon and carbon-free alternatives. So what does ALEC recommend in lieu of "onerous" government regulation? "What we encourage and what we would love to see more of -- and several companies are stepping up, especially ones that are sitting on cash reserves -- is that they step up and look for those solutions to affordable energy, reliable energy in all ways," Nelson told NPR's Diane Rehm. "So we would really encourage seeking out all different solutions to the issue."